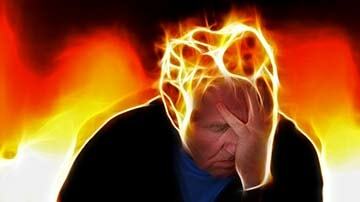 Astrology.Care - How do the different Zodiac Signs fight with Stress and Frustration? How do the different Zodiac Signs fight with Stress and Frustration? Let's see! Aries: Aries are back-breakers, they are not that easy to defeat. However, their violence and anger are their shortcomings that always make the bad situation even worse. They have anger issues and need to be more balanced. The first their reaction to something that disappoints them is pure anger and they can even hit the wall. In case Aries are in a bad mood or simply sad they don't need someone else to cheer up. They are quite self-sufficient. They can fully restore independently. Taurus: Taurus always has a backup plans that provide them options for reacting, though it sounds strange. They like to be prepared. If they are prepared, this feeling keeps them far away from bad mood and nervousness. Gemini: Gemini is a sign that can go through many situations and be successful and positive. In order to cheer them up, you'll need to remind them of something good from the past. Tell them how good they were when they accomplished a tough goal and it is going to bright them up. Cancer: Cancers will go through anything in their life, if they are sure that it is the way it should be. Tell them that it is not their fault and it is destiny – they will feel relieved. They love to think that fate dominates over people, so in times of trouble tell them what they'd like to hear. Leo: They are very aggressive to critique, their pride and ego won't let them analyze and accept the mistakes made. If you want to cheer them in the troublesome period, just compliment them on something and you'll see how their mood will change. Virgo: Virgos, as well as Leos love to hear compliments about their accomplishment and their looks. It works especially well, if they are in a bad mood. They will realize the possibilities of future and will stop worrying about the past. Compliments and encouragement here works as motivation for Virgos. Libra: These people are very kind and hearty, but in tough times they need someone who won't listen to their whining, but will pull them together. If you need to help a Libra – be honest and motivate them for actions. In this case they will stop being sad, and would make real steps for improvement in their life. Scorpio: Scorpios are rare to show their sadness or negative feelings on their face. Even in shocking situations their face is rather worried, than shocked. They are very composed people. Scorpions are thick-skinned and it is hard for them to acknowledge that they are the reason of the bad situation, they rarely admit their mistakes. Tell them to change their attitude and analyze the situation from the outside, even if you need to be mean to them. Sagittarius: Sagittarius doesn't like to be in a state of a problem. They try to solve it as soon as possible and get out of the mess they are in. In some cases to help them, just give them a push to change something and they will start acting immediately. Capricorn: They need someone strict and tough right beside them to pull them out of a whining state. Tell them to realize the situation and consequences. Give them some time. Some time after they will be back in a good mood. Aquarius: Aquarius doesn't think about future, the only thing that matters is present. If they are sad, they start to find the ways to get rid of this loading feel. They are oriented inwards and don't listen to the advices of others, though it doesn't mean that they don't need a good advice. They will accept the advice, but they would never admit they came to the solution with someone's help. Pisces: Pisces need to know that they are in a friendly and loving circle. They need support and friends around to comfort them. Make them feel safe and needed. Some time after they will be back, fully recharged.